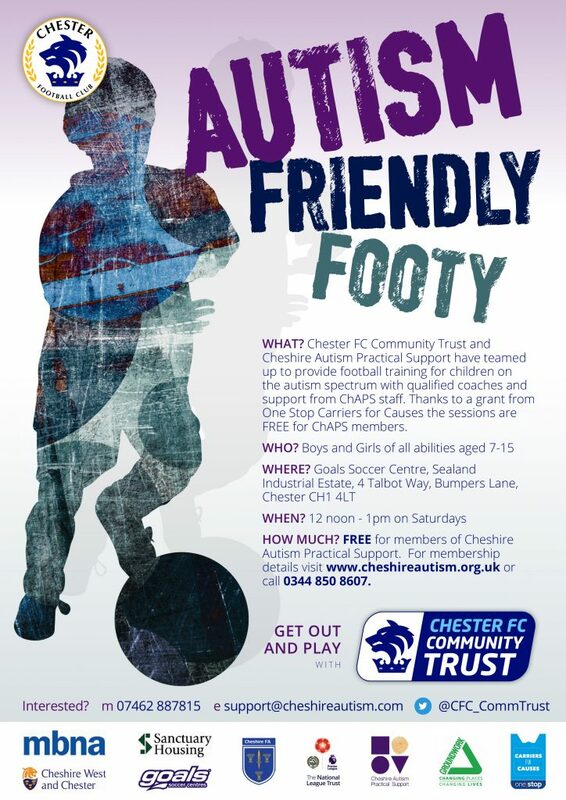 Chester FC Autism Friendly Football restarts this weekend. The sessions, which are run in partnership with Cheshire Autism Practical Support (ChAPS), offer weekly football training sessions for children with autism spectrum conditions. Launched with a £2,000 grant from the One Stop Carriers for Causes scheme, the autism friendly football club is free for ChAPS members and proved very popular with youngsters and their families. Qualified coaches and ChAPS support workers lead the sessions, which take place at Goals Soccer Centre on Saturday afternoons from 12 noon to 1pm. ChAPS supports families with autism spectrum conditions or Aspergers syndrome, whether diagnosed or not, across Cheshire. The charity aims to improve autism awareness, increase independence skills and use early intervention techniques to improve outcomes for children. It provides advice, support, parental training, advocacy, counselling, mindfulness as well as a wide range of activities which are free for members. For more information about the 80 plus activities ChAPS run every month, including how to become a member of ChAPS, visit www.cheshireautism.org.uk or call 0344 850 8607. Chester FC Community Trust needs support from Blues fans and the public to help win funding as part of the Aviva Community Fund 2017. The charity is asking people to vote to help it win funding of up to £10,000 to launch Raise Your Game, a new project providing disadvantaged young people aged 16-25 who are passionate about sport with the skills, qualifications and confidence to be game changers in the community. Jim Green, chief executive of Chester FC Community Trust, said: “We need as much support as possible from the people of Chester as only those projects with the most votes will become finalists. “Raise Your Game has the potential to help young men and women who may be disaffected or disadvantaged turn their lives around and express their passion for sport as coaches, gaining new qualifications and life skills, making new friendships and opening doors to employment and education. “There are young people across the city with the capability to have a really positive impact on their communities and Raise Your Game will support them to realise that potential. Chester FC Community Trust uses the power of sport and appeal of Chester FC to improve and enhance the lives of people living in Chester and the surrounding areas. The registered charity delivers high quality football and physical activity, education programmes, social inclusion provision, and health & well-being projects to people of all ages and abilities. To get behind Chester FC Community Trust and help make a difference to the lives of local people, visit https://community-fund.aviva.co.uk/voting/project/view/17-496 and submit your vote before 21st November 2017. Once registered, users have 10 votes that can be used at anytime to support their chosen project. Chester schools will be getting behind the Blues when Chester FC face Dagenham & Redbridge live on BT Sport next month. Chester FC Community Trust has invited local schools to take part in a half-time parade during the National League clash on Saturday, November 25th (12.15pm KO). Lache Primary School, St Oswald’s Primary School, Delamere Academy, Cherry Grove Primary School, St Martin’s Academy, Dodleston Primary School and Chester Blue Coat Primary School have already registered for the match. 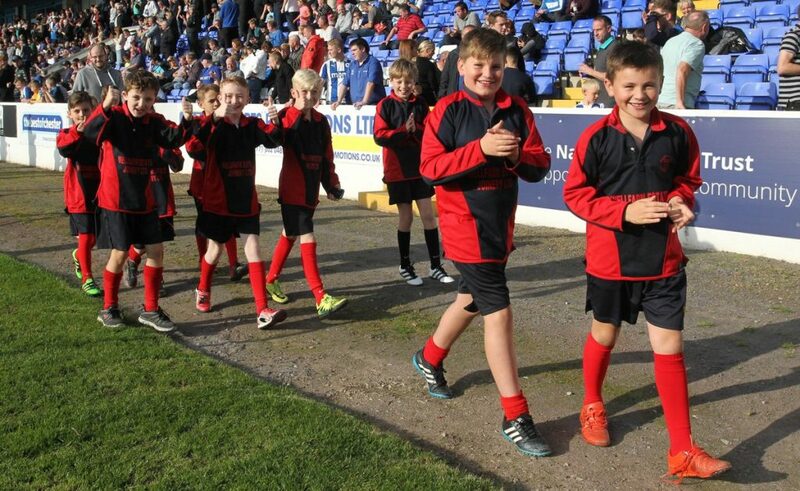 Last season hundreds of children took part in parades and contributed to a buzzing atmosphere inside the Swansway Chester Stadium. With the match live on BT Sport, schools have the chance to get themselves on television and children are encouraged to wear their school kits, bring flags and banners, and make lots of noise! As well as parading around the pitch at half-time, youngsters will have the opportunity to meet some of the players before the game for photos and autographs, and Lupus, the Club’s mascot. Admission for a teacher and a team of 11 children is just £30. Unlimited extra children can be added at £3 each and parents, grandparents, family and friends can come along and join the fun at £10 each. 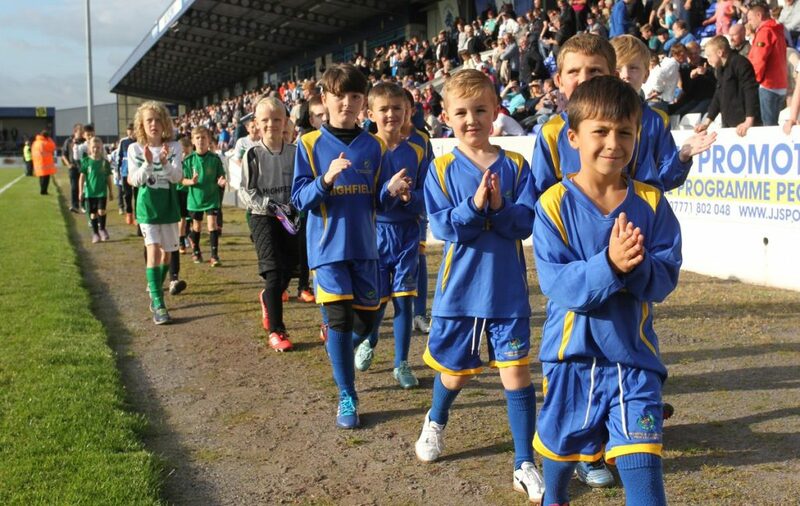 Schools wishing to register or find out further details can email community@chesterfc.com or call 07512 355396. Chester FC Women’s team-mates Becky Tebb and Jamie-Lee McDowell have been shortlisted for the 2017 Northwest Football Awards. The awards are now in their tenth year of recognising the good, the great and the un-sung of the beautiful game in the region. Jamie-Lee is a finalist in The Fine Bedding Company Women’s Player of the Year category alongside Everton’s Gabby George, Caroline Weir of Liverpool and Manchester City’s Lucy Bronze, who has recently signed for Lyon. 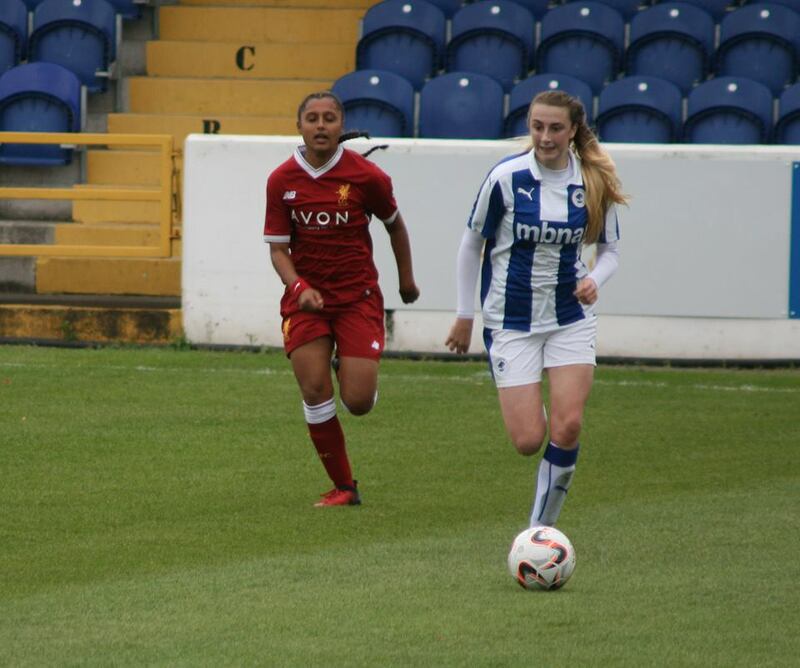 Becky is on a four-strong shortlist for Women’s Rising Star award, alongside Niamh Charles of Liverpool Ladies, Megan Finnigan of Everton Ladies and Manchester City’s Keira Walsh. 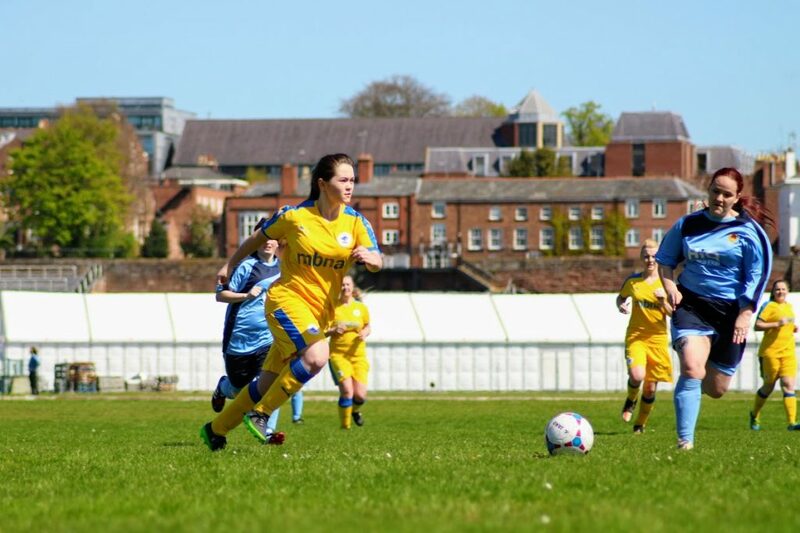 Jim Green, chief executive of Chester FC Community Trust, said: “It’s fantastic recognition for both Jamie-Lee and Becky, and for the Chester FC Women’s set-up. “I know manager Dean Vian holds both players in very high regard and is equally delighted for them. They have established themselves as very important members of the squad and contributed to an excellent start to the 2017/18 season for the team. Joining Jamie-Lee and Becky on the list of finalists is club-mate Ryan Astles with the Blues defender shortlisted for National League Player of the Year along with Andy Cook of Tranmere Rovers, Barrow’s Moussa Diarra and Macclesfield’s George Pilkington. All awards will be announced and presented at the Northwest Football Awards at The Point, Emirates Old Trafford on Monday 13th November, hosted by the BBC’s Dan Walker. For more information go to www.northwestfootballawards.com. Calling all Junior Blues! 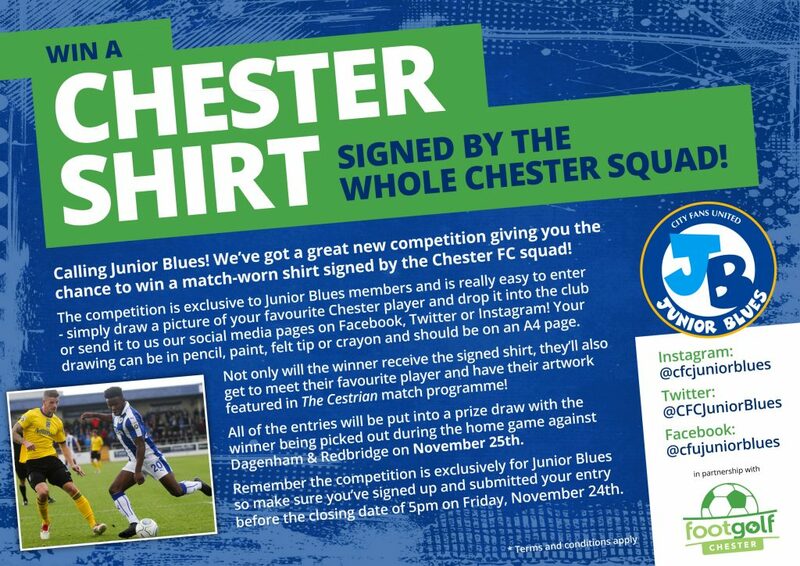 We’ve got a brilliant new competition giving you the chance to win a match-worn home shirt signed by the Chester FC squad. The competition is exclusive to Junior Blues members and is really easy to enter. Simply draw a picture of your favourite Chester player and drop it into the club or send it to us our social media pages on Facebook, Twitter or Instagram. Your drawing can be in pencil, paint, felt tip or crayon and should be on an A4 page. Not only will the winner receive the signed home shirt, they’ll also get to meet their favourite player and have their artwork published in The Cestrian match programme! All of the entries will be put into a prize draw with the winner being picked out during the home game against Dagenham & Redbridge on November 25th. Remember the competition is exclusively for Junior Blues so make sure you’ve signed up and submitted your entry before the closing date of 5pm on Friday, November 24th. The FA Girls’ Football Week is back this November and Chester FC Community Trust is looking forward to being part of it. Taking place between 6th-12th November, The FA Girls’ Football Week is a national campaign giving even more girls the chance to play football. The whole country will gear up to encourage football activities for girls, which can include playing, training or even simply learning more about the beautiful game. Throughout the week Chester FC Community Trust will be encouraging women and girls to get involved in fun, engaging sessions and working with partners to highlight the opportunities that exist for everyone, regardless of experience or knowledge of football, to play the beautiful game. Full details of the activities on offer during The FA Girls’ Football Week will be confirmed in the coming weeks. Schools or clubs interested in taking part with support from Chester FC Community Trust are invited to email community@chesterfc.com.